Country Music Hall of Fame singer/songwriter Jimmy Fortune is gearing up for the October 23rd release of his highly-anticipated album Hits & Hymns. Appropriately titled, the project sees Fortune performing some of his classic Statler Brothers HITS, in addition to top Gospel hymns. The album, which features unique collaborations with some of country and Gospel music’s top artists including Vince Gill, The Isaacs, Dailey & Vincent, The Oak Ridge Boys, Ricky Skaggs, the Gaither Vocal Band and The Whites, will be released via Gaither Music Group. Over the years, Fortune has established himself as one of the most distinctive tenor singers in country music history. After joining the legendary Statler Brothers in 1982, Fortune experienced Gold and Platinum records, won CMA and IBMA Awards and was inducted into both the Country Music Hall of Fame and Gospel Music Hall of Fame. The Hits & Hymns CD and DVD collections will be airing as part of a TV special slated for PBS, DirecTV, AT&T U-verse, GaitherTV, TBN, RFD, FamilyNet, CTN, GMC, GMTN, Guardian, Liberty, TCT and TLN. It will air in Canada on Vision TV, CTS, The Miracle Channel and Hope TV. Fortune was recently featured on RFD-TV’s “Larry’s Country Diner” and TBN’s “Praise the Lord” programs, sharing songs from the new release. The products will be exclusively distributed by Capitol Christian Distribution and will be available throughout general market stores, including Cracker Barrel Country Store®, and the Christian marketplace in addition to online retailers including iTunes, Amazon and www.gaither.com. 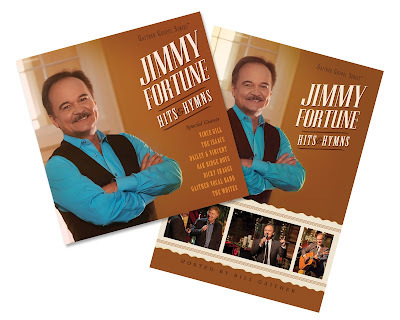 For further information regarding Fortune or Hits & Hymns, please visit www.jimmyfortune.com or learn more on his Facebook page.